Select the object (or objects) to apply the drop shadow to. In the Appearance panel, make sure that Stroke is selected. In the Drop Shadow dialog box that appears, select the Preview check box in the lower-left corner. You now see the drop shadow applied as you make changes. Mode: Select a blending mode from this drop-down list to choose how you want the selected object to interact with the objects underneath it. The default is Multiply, which works well — the effect is similar to coloring with a magic marker. 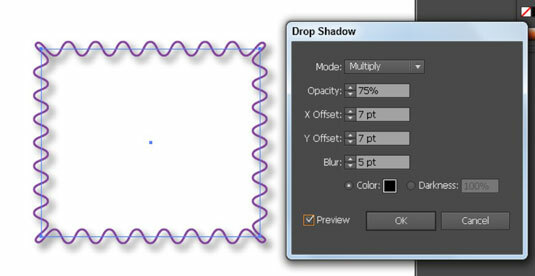 Opacity: Enter a value or use the drop-down list to determine how opaque or transparent the drop shadow should be. If it’s too strong, choose a lower amount. Offset: Enter a value to determine how close the shadow is to the object. If you’re working with text or small artwork, smaller values (and shorter shadows) look best. Otherwise, the drop shadow may look like one big, indefinable glob. The X Offset shifts the shadow from left to right, and the Y Offset shifts it up or down. You can enter negative or positive numbers. Blur: Use Blur to control how fuzzy the edges of the shadow are. A lower value makes the edge of the shadow more defined. Color and Darkness: Select the Color radio button to choose a custom color for the drop shadow. Select the Darkness radio button to add more black to the drop shadow. Zero percent is the lowest amount of black, and 100 percent is the highest. As a default, the color of the shadow is based on the color of your object, sort of — the Darkness option also has a play in this task. As a default, the shadow is made up of the color in the object if it’s solid. Multicolored objects have a gray shadow. When you’re finished, click OK to close the dialog box.